A sheet of contacts. Thirty-six exposures. Six strips of six photographs, taken one after the other. You read them from left to right like a text. It’s the diary of a photographer. You see what he sees through the viewfinder – his hesitations, his hits, his misses, his choice. You rarely see the contacts of a photographer. You only see the picture chosen. You don’t see the before or the after like you do on a proof sheet. A picture is taken at 1/125th of a second. What do you know of a photographer’s work? A hundred pictures, let’s say a hundred and twenty-five – well that’s a body of work. That comes to all told – 1 second. Let’s say more like two hundred and fifty photographs – that would be a rather large body of work and that would come out to 2 seconds. The life of a photographer, even a great photographer as they say – 2 seconds. If there’s one thing photographers must never, ever do, it is to show their contact sheets or to display them in public. One must never show one’s contact sheets because they may prove too revealing, because wrong conclusions could be made and perhaps, and even worse, correct ones. 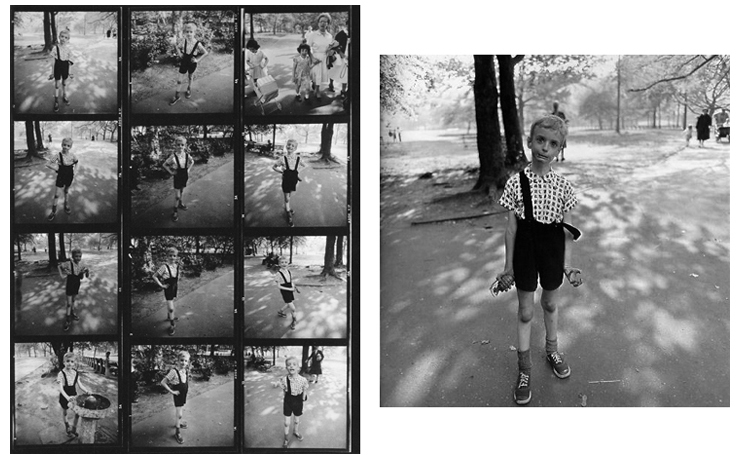 The contact sheet, whether created in the darkroom from strips of film or on a computer with digital files, functions as the photographer’s sketchbook. Everything is revealed. 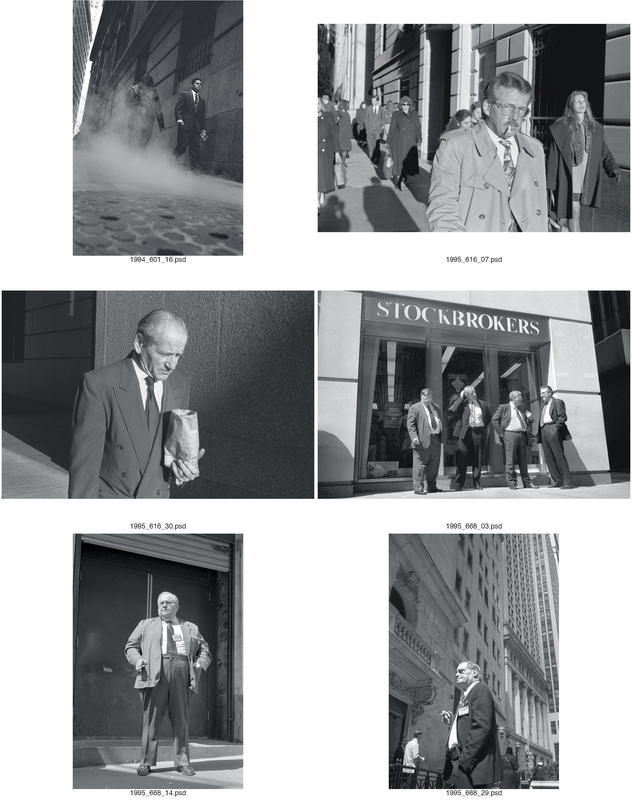 Quite literally, a step-by-step catalog that documents the photographer’s working process – the photographer’s relationship to their subject matter, how they’ve worked with the camera and their materials, the successes and failures – it’s all there in the contact sheet. 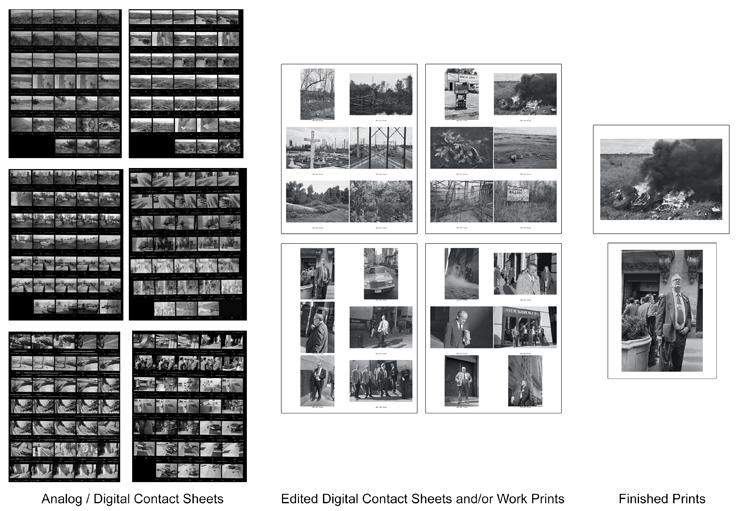 And over the course of a photographer’s life, the contact sheets accumulate and become the summation, a private diary, of a photographer’s experience. No wonder there’s the hesitation to show one’s contacts. The fear of criticism that the photographer is not as accomplished as one might think upon viewing individual, successful pictures can be overwhelming – the anxiety that the contact sheet will reveal more failures than successes. What photographer would want that? Maybe every photographer who is striving for clarity in their work and insight into what otherwise may be missed possibilities for an image on a contact to become a photograph. While it’s completely understandable to not want to reveal to anyone one’s failures and potential short-comings as a photographer, there exists the opportunity for another set of eyes to mull over what may not have been considered on first glance. Once the photographer has moved past the initial shock of anxiety when presenting one’s contacts for review, a moment of critical analysis and dialog can take place of which the benefits may not only be realized in the determination of what images may become photographs, but also and maybe just as importantly, the discussion of considerations to utilize when making future images. The nature of developing such a working process requires not only a thoughtful and critical eye in terms of editing, but also a willingness to move beyond fear and inhibitions as the process is about making images into photographs. Images are shot and contact sheets or edited digital contact sheets are made. Edit. And then, possibly more contact sheets or edited digital contact sheets. Or work prints – made in the darkroom and/or digital kiosk machine prints. More editing. And then – maybe a photograph. Such a working process requires the photographer to be active and engaged with their work throughout, and sharing that may be beneficial not only to one’s own work, but also others as they develop and work through their own process. The making edited digital contact sheets (Contact Sheet II) can be done automatically in Photoshop with a plug-in that can be download from Adobe or in Lightroom. It will be necessary to set-up a folder to automatically-generate the images for the contact sheet. It is important to make sure the images are right-reading so that all of the images can be seen in the same orientation on an 8.5″ x 11″ print. The Document dimensions should be 7.5″ x 10″ (for predominantly vertical source images) or 10″ x 7.5″ (for predominantly vertical source images) at 300 ppi and in RGB mode. For a 6-up contact sheet, it will be necessary to set-up the document so that the Thumbnails are placed in Columns of 3 and Rows of 2 with Auto-Spacing. 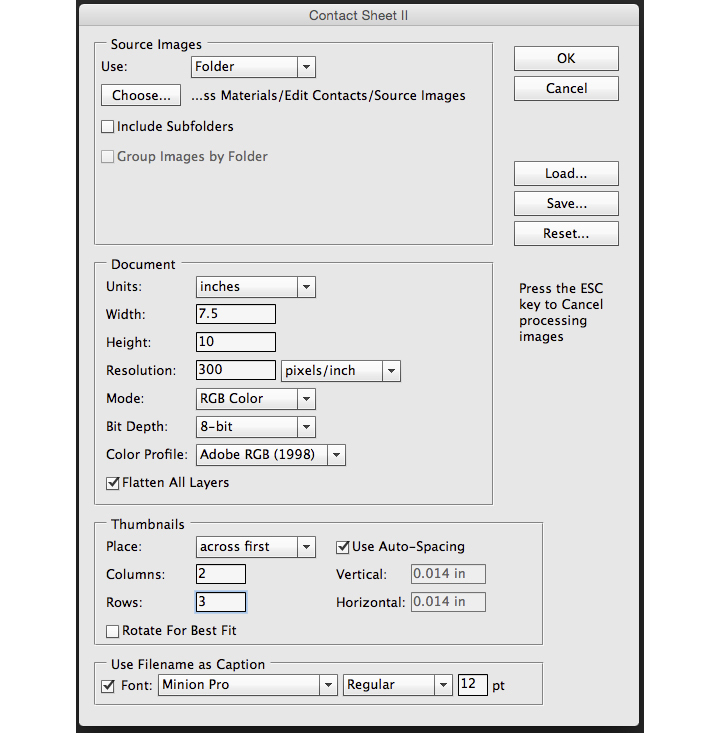 The Filename As Caption can be checked so that the file name is printed below each image on the contact sheet. Once you’ve selected all of the contact sheet document parameters, click OK to generate the contact sheet. 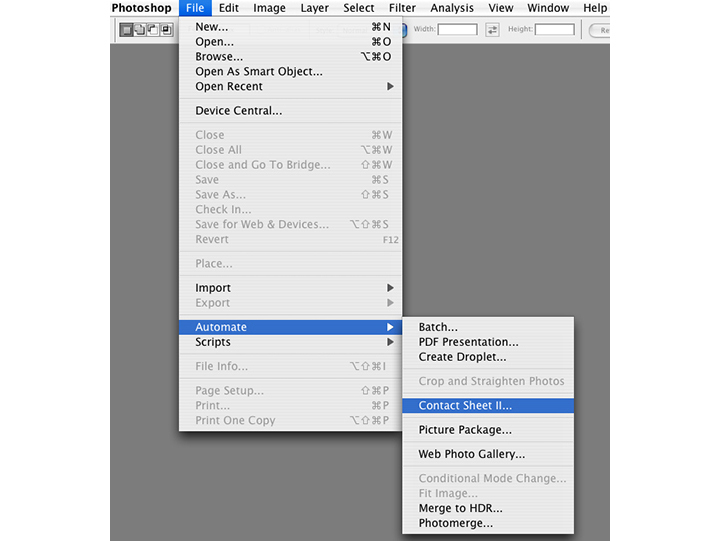 Once it has been created, it can be saved as its own Photoshop file and/or printed. Shoot images that reflect focused attention on your curiosities and interests through your photographic vision and sense of technical execution and craftsmanship. It is essential that you develop a sustainable working process to reflect a sense of considered thought and active visual exploration. Thinking about your conceptual concerns and what to photograph, I would propose you gravitate towards what your interests and curiosities are. How would you approach those concerns photographically to reveal what they would look like as a series of photographs? In addition to their visual engagement, what do you want the photographs to reveal, suggest or evoke, intellectually and/or emotionally, in relationship to these ideas and perceptions? Consider how your use of the camera, photographic aesthetics, materials and processes, as well as your technical execution will be utilized in making photographs that begin to suggest and inform these curiosities and ideas. In considering your photographic vision and use of camera aesthetics, give particular attention to your use of the photographic frame, vantage point, moments of exposure and the role and use of light to reveal your interpretation of the thing itself and details, as well as materials (black & white and/or color) and processes (analog, digital and/or alternative/hybrid process). Using the feedback from the weekly discussion, continue to shoot images that reflect focused attention on your working process. At this stage of your conceptual development, it is essential and necessary that your idea(s) reflect a sense of active visual exploration.